Ships transporting cargo help make our modern economy possible, but they also are places where harmful accidents can occur. Much of the cargo transported in tankers—oil, liquid natural gas (LNG) and chemicals—is hazardous. Ships of all types, including dry cargo ships, container ships, carriers and tankers, can be the site of injuries and deaths to crewmembers and dockworkers.The maritime and Jones Act lawyers at Latti & Anderson LLP have helped clients injured in all types of shipping accidents, and we have proved that shipping companies do not always follow the regulations in place that are intended to protect the cargo and crew. Merchant seamen are not the only maritime workers at danger in a shipping accident, however. Dockworkers can suffer injuries during pump and pipeline malfunctions, hazardous spills or loading and unloading dangerous cargo. Accidents while loading and unloading and working on containers ships are tragically common. Our experienced maritime attorneys know that when a container ship accident occurs, the injured victim could suffer serious and lifelong injuries, inhibiting his ability to work and causing financial and emotional distress for the victim and his or her family. The ISM mandates that tankers and container ships must undergo regular audits for safety; however, not all ships are in compliance, and some fail to follow regulations. This can lead to accidents that result in serious injury and even death. In many cases, employers will do everything they can to limit your recovery and will try to blame the accident on the oil tanker or cargo ship worker. Our firm has handled claims against numerous shipping companies throughout the United States, recovering money for past and future wage loss, past and future pain in addition to suffering and mental anguish, medical bills and future medical treatment. We have received numerous multimillion-dollar settlements and verdicts for our work in these areas. In a free, no obligation consultation, one of our attorneys can explain the law to you, advise you of your rights as well as discuss the type of compensation you may deserve for your injury to being helping you through this difficult process. 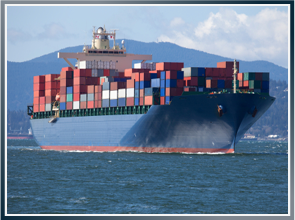 If you have suffered an injury on a container ship or other vessel, please do not hesitate to contact the maritime trial lawyers at Latti & Anderson LLP. We represent clients nationwide and can help you or a loved one recover the most for the injury.